In case you missed it, we had some visitors in the building yesterday. 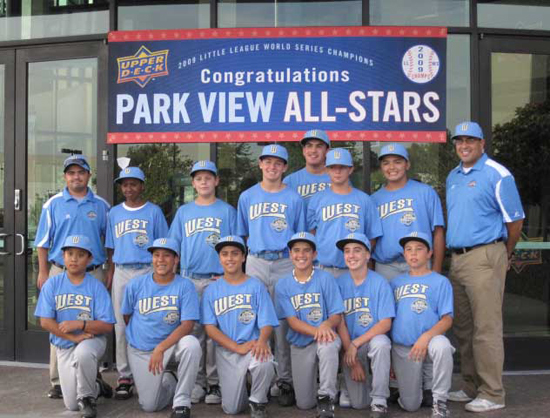 To let you in on a little behind-the-scenes secret, our office started buzzing like crazy when Chula Vista’s Park View All-Star Little League World Series Champions arrived; it was like getting a visit from rock stars, honestly. Seeing people more than half your age, from your own community who play a sport you love and won a world championship in is pretty powerful stuff. Introspective emotions aside, it was a great visit. The champs were greeted by Upper Deck staff, got to take home all kinds of goodies, and most importantly, posed for their own baseball cards. We have athletes in here all the time, and don’t get me wrong, guys like LeBron and Kobe are always smiling and enthusiastic when they visit. But you could tell these kids were extra excited to get a tour of our facility here in Carlsbad, and get their likeness on some Upper Deck cards. Check out some of the photos below, and click here to see a video of the event from our local CBS San Diego news coverage. In the clip, you’ll see the process of creating the card, and a sample of the final product! The Gang’s All Here: The entire 12-player Park View All-Stars Little League lineup, plus manager Oscar Castro, left, and coach Ric Ramirez, pose in front of Upper Deck headquarters following their individual trading card shoots. 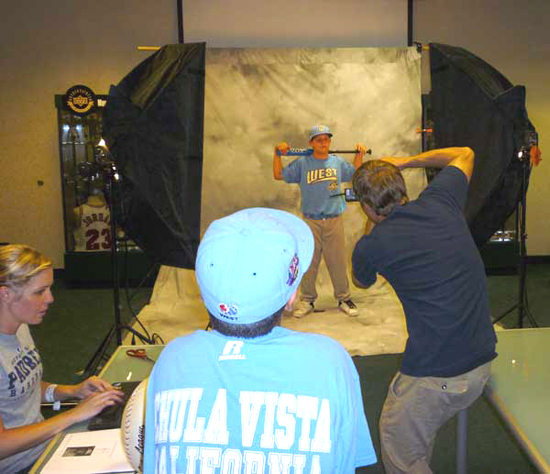 Portrait Time: Park View Little League All-Star Jensen Peterson strikes a pose for his new Upper Deck baseball card. Computer Savvy: Several of the Park View All-Stars crowd around art designer Richard Gassman’s cubicle inside Upper Deck’s Prepress department to see their cards come to life. 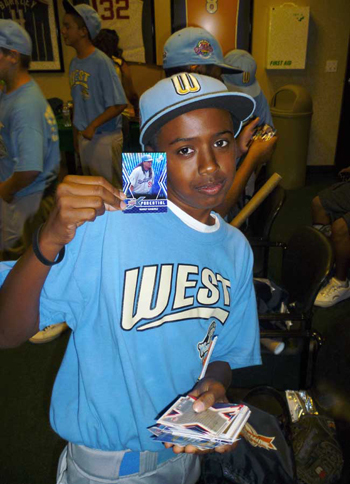 Man-Fan: Park View center fielder Markus Melin shows he’s a fan of Manny Ramirez’s with his newfound UDx baseball card. Nice Haul: Park View players Bulla Graft, Kiko Garcia, Seth Godfrey and Nick Conlin make off with some cool Upper Deck swag. With Upper Deck’s Carrie Peterson typing away, and local news crews within earshot, four of the Park View All-Stars provide copy for their cardbacks. That is awesome that you guys did that for those kids. Does anyone know the stats regarding how many Little League Champions went on to play big league ball? Based on there performances so far they certainly seem destined for great things. Man, these kids are set for life if they decide to pursue thier baseball careers. I hope they do pursue because it can mean big opportunities for them. I rememeber people going crazy after they won. I remember some people either calling off sick or putting vacation days to go see this game. I did not realize this event was huge until I was told about it. I will definitly catch it again next year if I can.